With Father's Day just around the corner, Dwayne "The Rock" Johnson is being hailed as father of the year by fans after an Instagram post doting on his breast-feeding girlfriend. 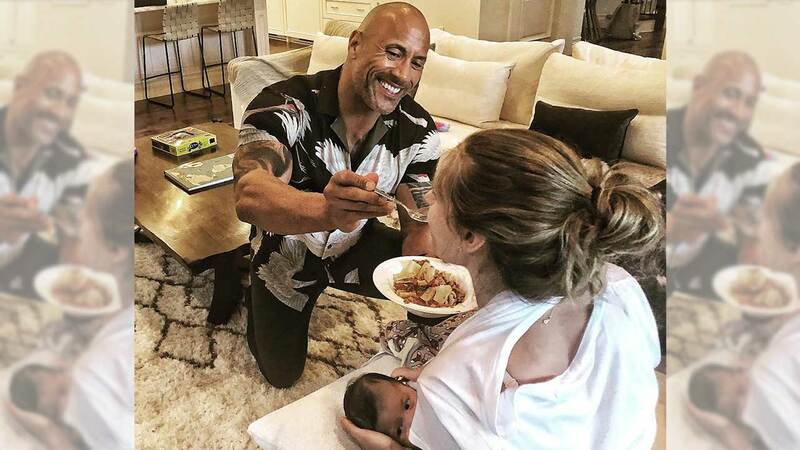 The photo, posted on June 10, shows Johnson helping his girlfriend, Lauren Hashian, eat as she breast-feeds their infant daughter. "I'll handle this business," reads the caption. "Mama @laurenhashianofficial has her hands full nursing/feeding Baby Tia, so I'm feedin' mama her dinner. My pleasure. So much respect to her and all mamas out there holding it down and running things." Johnson and Hashian welcomed their second baby girl, Tiana Gia, or Tia, in April. The couple also has a 2-year-old daughter, Jasmine, and Johnson has a teenage daughter, Simone, from a previous marriage. "Your crazy dad has many responsibilities and wears many hats in this big ol' world, but being your dad will always be the one I'm most proud to wear," he wrote on Instagram when Tia was born. As with his other reflections on fatherhood, Johnson's thoughts on breast-feeding were met with praise by fans online. "The world needs more men like you!" wrote one commenter. "If that not love then i don't know what is," wrote another.